Topics: Classes, Lessons, and Gallery. 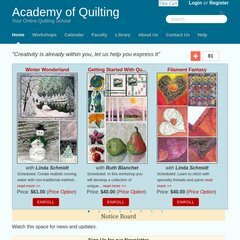 academyofquilting.com Mariners Compass Quilting Class - Online quilting classes at ..
PHP/5.2.17 is its coding language environment. ns2-onja.centos-server.net, and ns1-onja.centos-server.net are its DNS Nameservers. It is hosted by American Registry For Internet Numbers (Virginia, Chantilly,) using Apache web server. PING (68.171.213.116) 56(84) bytes of data. Pinging the server, resulted in a 20.0 ms response.